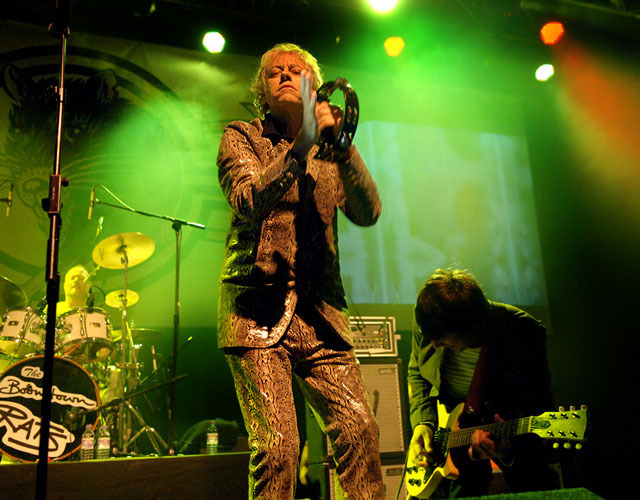 Share the post "Gig review: THE BOOMTOWN RATS – Roundhouse, London, 26 October 2013"
The amount of shows I’ve seen this year that I thought I never would is truly amazing: for every idol that dies, another seemingly resurrects themselves with unerring timing, as if suddenly aware that there may not be many such chances left. 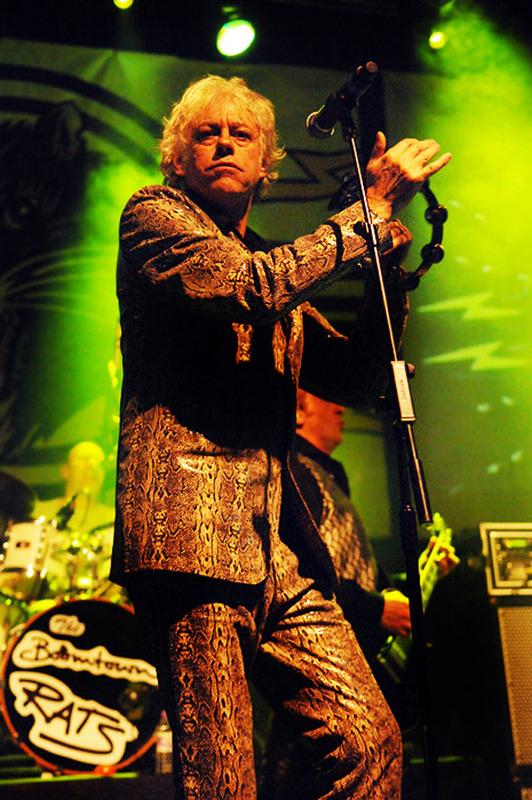 The Boomtown Rats, whilst a decade or so younger than some of my major influences, still fit this category: with an average age of 55-60, and a very misunderstood legacy, it had to be now (some 28 years since they last trod the boards at Live Aid) or never. And aren’t we glad it was? In some respects of course, Live Aid is precisely the problem. 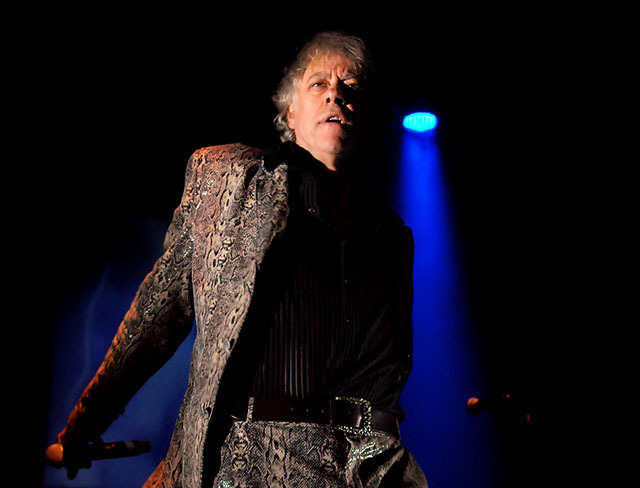 With the exception of marrying the tragic Paula Yates and producing a series of newsworthy daughters, Sir Bob Geldof (sarcastically referred to as such before he was actually knighted) has seemed destined for the last two-plus decades to be remembered as the man who (helped on by, let’s be candid, a rather crap single featuring the worst of not one but TWO decades of British pop stars) organised two huge concerts in London and America in order to raise awareness in the West of the plight of millions of starving Africans. A noble cause, for sure, regardless of which side of the political fence one dwells, but unfortunately, also the start of this country’s descent into stadium rock blandola, also heralding the rise of everything ‘big’, grandiose and unsubtle that was soon to follow. Moreover, what began as a world-changing political achievement soon became, musically, a millstone, robbing the man of recognition for what he started as – a worthy heir to the Jagger/Bowie/Johansen canon, one of the finest frontmen in rock n roll, and the leader of a band whose sound successfully conjoined the proto-punk of the Dolls and Dictators, R’n'B of Van Morrison, street poetry of Springsteen, hard rock of Thin Lizzy and Horslips and spiky, skinny tied sounds of the Mod revival, making them a virtual synthesis of everything that made the late 70s exciting. Thus, it’s that legacy we’re here to revisit, and that point we’re here to reiterate – and about bloody time too. As if by way of illustration, the band – all still remarkably dapper save for Simon Crowe, but then again, drummers are allowed to break the rules – hit the ground running, launching straight into ‘I Never Loved Eva Braun’ with all the force of a crack SS unit, Geldof entering right on cue resplendent in the most decadent of faux-snakeskin suits. 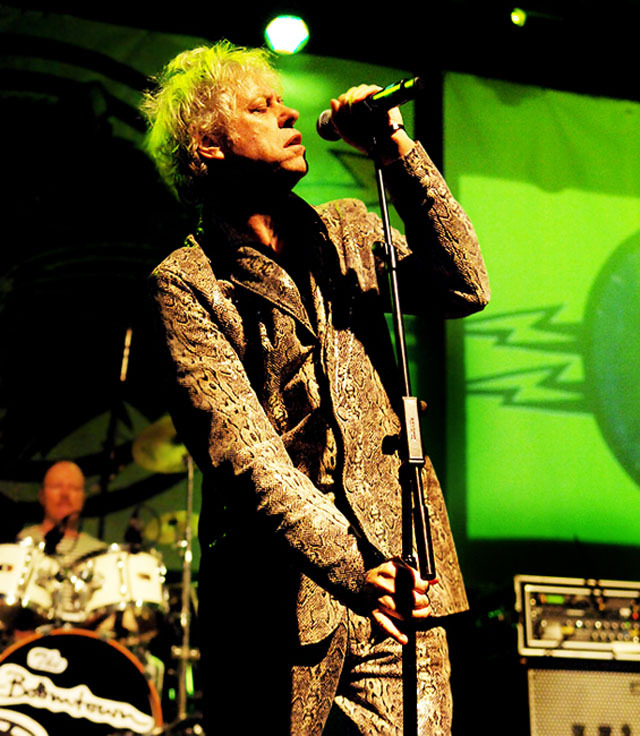 His vocals are a little shaky to begin with (and the sound is nowhere near loud enough for such a vast venue) but by the time of the robotic ‘Like Clockwork’ and the sleazy, slutty ‘Neon Heart’, he’s found not only his range but his groove. The frenzied rhythm n blues of ‘She’s Gonna Do You In’ prompts a touch of Brilleaux-style harmonica action and some serious strutting: all of a sudden, it’s as if the last 30 years never happened. Yet they did, and Geldof is only too aware: no song could be a more apt encapsulation of our Orwellian digital age than ‘Someone’s Looking At You’, and the spoken introduction only highlights this fact. The band are on fire now: Garry Roberts thrashes at his axe like the Celtic Keef he always saw himself to be, and Pete Briquette (I still can’t believe how many people I have to explain that name to) stands like an unmovable, towering man-mountain of bass and harmony vocal, but Bob, simply unable to believe his luck, is a man resurrected. The more mid-paced Bruce/Van-infused street epics of ‘Joey’s On The Street Again’ and ‘When The Night Comes’, scattered at perfect points throughout, and the dub rhythms of ‘Banana Republic’ – the song that prompted Gerry Cott’s original departure – take things down a notch, while the inevitable singalong lighters-in-the-air moment of ‘I Don’t Like Mondays’ provides the show’s one concession to balladry, but the pogoing, powerpopping ‘She’s So Modern’ (a song which ironically now describes a list of very retro attributes indeed) and brash, Stonesy, swaggering ‘As Close As You’ll Ever Be’ soon recharge the rockets with a fervour truly unexpected. Sure, we’ve all had a few, so there’s always a chance we could be lost in nostalgic, beer-goggled retromania – but no, they really are this good. 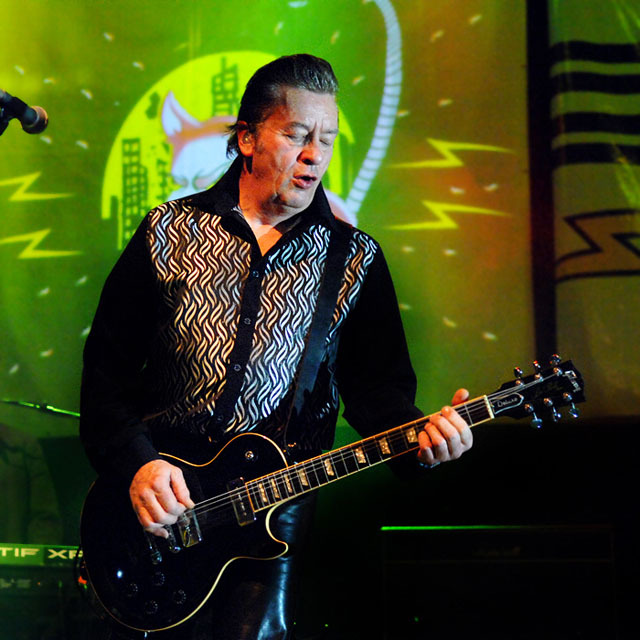 And just when you think it couldn’t get any better, ‘ladies and gentlemen, Mr Gerry Cott!’ Yes, he’s back too, riffing away on the one-two punk-n-B thrash of ‘Mary Of The Fourth Form’ (a song which no-one would ever get away with nowadays) ‘Looking After No 1′ and, by way of contrast, ‘Rat Trap’ (at 7 minutes long with no chorus, still one of pop’s most unusual ever chart toppers) like he never left. 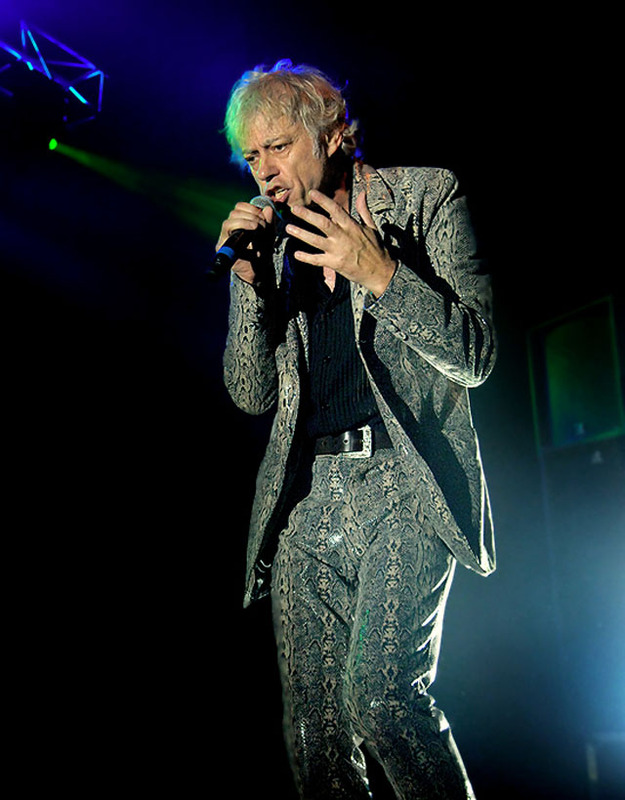 Questions persist as to why he doesn’t just rejoin properly, to say nothing of the absence of the pyjama-clad Johnny Fingers (surely, after Geldof, the most recognisable member) but the fact that we’ve actually seen what we’ve seen is miracle enough. Let’s be truthful, in the invisible ‘cool’ book written by music’s self-appointed arbiters, the Rats have not been served well: always too ‘rock n roll’ for the punk purists (or in some cases unashamedly AOR, as the melodic refrains of ‘Having My Picture Taken’ still amply demonstrate), too spiky and confrontational for the yacht-rockers, and generally too musical to be ‘minimalist’, their reformation has not been clamoured for by the Crouchon and Stokey posse as has those of several of their peers, but its timing, in a world where rock n roll needs heroes (not to mention when both Irish and political music per se have been tainted by the ramblings of the twattish Bono) could not be more apposite. Whoever had the idea of staging this gig the same night as Graham Parker at Shepherds Bush (same audience, age group, influences, producer, backing vocals etc), ensuring that show sold out and this one didn’t, deserves a hefty clout with a pointed stick, but regardless, to those who have attended, this is vindication, pure and simple. And great rock and roll. Sadly, they have to go and blow it. It could have ended so perfectly, with the Steinman-meets-Aladdin Sane thrust of ‘Diamond Smiles’ and 1200-odd voices chanting the fading ‘dadun-duums’ of its outro refrain, which, to those who bugger off quickly for the tube or car park, it does – but sadly, we who stay get treated to the pointless, sub-techno stompings of a new track entitled, of all things, ‘The Boomtown Rats’ – by dint of that name not only making a mockery of the preceding 90 minutes but also their entire oeuvre, as well as showing just how out of touch with music Geldof, or any vintage artist, runs the risk of being by attempting to be ‘contemporary’. 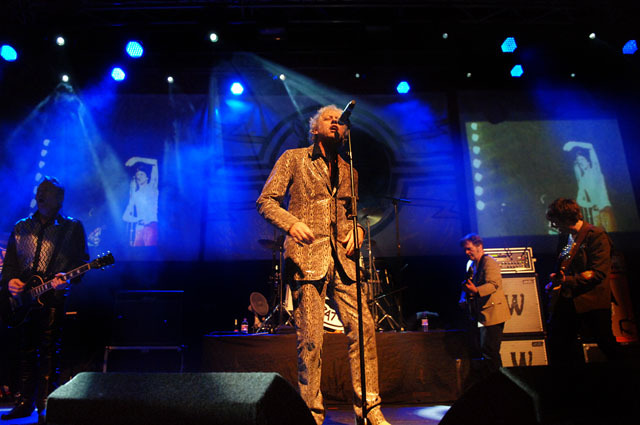 This entry was posted in All Posts, GIG REVIEWS and tagged 26 October 2013, Bob Geldof, gig, London, punk, review, rock, Roundhouse, The Boomtown Rats. Bookmark the permalink.